← Even with extreme precautions doctor contracted Ebola – what will ordinary citizens do if virus goes pandemic? July 2014 – RUSSIA – Two more mysterious holes have opened up in Siberia after the original crater appeared in the Yamal Peninsula earlier this month. 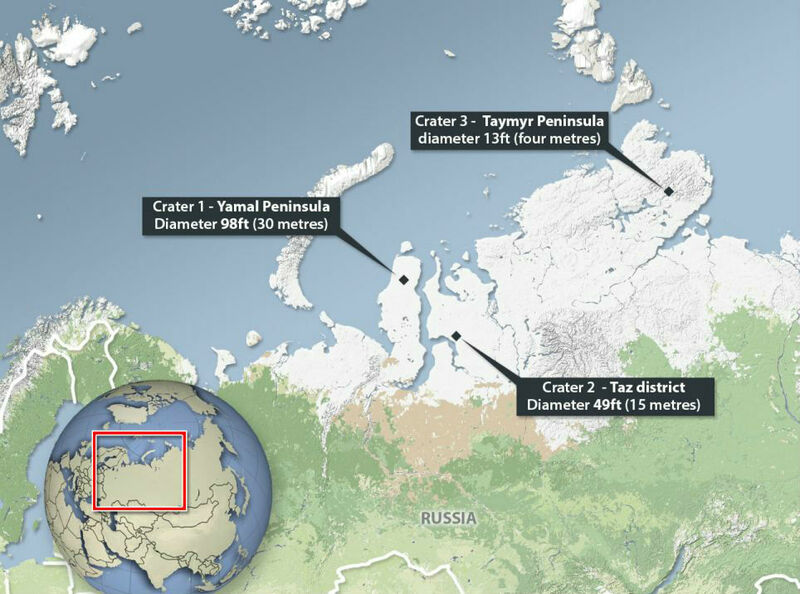 “Yamal” is a name that literally translates to “end of the land.” Both new craters were discovered by reindeer herders, who thankfully didn’t fall the estimated 300 feet to the bottom. In case the thought of bottomless black holes isn’t already conjuring up images of an apocalyptic doomsday, then here are some videos and pictures to ensure you don’t sleep at all tonight. What are they, and why are portions of Siberia now beginning to collapse in huge holes? Scientists are still unsure as to what exactly is causing their appearance. Theories range from meteorites to stray missiles, a man-made prank or even aliens. However, The Siberian Times reports that the most common belief is that they’re the result of “melting permafrost due to climate change, causing a release of methane gas, which then forces an eruption.” So basically, these things might keep popping up if humans continue to treat the planet like their own personal trash can. One of the craters is on the same peninsula as the first one, while the other is on the Taymyr Peninsula. The first is 98 feet in diameter, the second is 49 feet, and the third is 13 feet. This entry was posted in Civilizations unraveling, Earth Changes, Earth Watch, Earthquake Omens?, Environmental Threat, Hazardous chemical exposure, High-risk potential hazard zone, Infrastructure collapse, Land fissures, cracks, sinkholes, Lithosphere collapse & fisssure, Natural gas explosion, Potential Earthchange hotspot, Signs of Magnetic Field weakening, Strange unexplained noises, Time - Event Acceleration, Unsolved Mystery. Bookmark the permalink. Who remembers when the scientist is Siberia discovered hell? I believe hell is opening up there. For those who do not know about this, look it up as Screams from hell. My opinion of course. Now, this is just a rumor, someone who probably has a run away imagination: that activity in yellowstone was causing this. I like the methane idea……. Who lives there? Giant moles? These truly are super weird…. They don’t seem to even look at all like the ones we see collapse in on themselves in places like Florida and such. Very interesting indeed…. I read about a theory saying that it was nuclear testing in the past that did those holes.